So how many of us had an April Fool’s Day prank done to us? Making someone feel like a gullible full is fun and light-hearted! Of course some know how to take it to far. One year, my dad, who is a math teacher, faked a heart attack in front of his class. Not cool! He has vowed not to do anything since then!! My favorite this year was simple. I texted people and told them that I had broken down near their house and I needed a ride cause I had been wandering around for a few hours. Most fell for it! My son didn’t. So did you pull an April Fool’s prank? What did you do? I trust that you were not like my dad years ago and take your prank too far? Of course being a fool to someone’s prank can be harmless and often ends up in laughter. We usually only do April Fool’s Day pranks to those we know best. But what happens when our lives are lived foolishly? Being a fool is no laughing matter. We all see people every day do things and we think to ourselves, “What a fool. Why would they do something so stupid?”. No one wants to associate or spend time with a person who lives like a fool. An ancient proverb says “Let a man meet a mamma bear robbed of her cubs than a person living like a fool!”. Have you ever been face to face with a mad bear who is on the hunt for the one who stole her cubs? Me either, and I never want to be! Think of that image in your mind. A mindless, ruthless, out of control bear that is ready to destroy anyone in its path. That is what a fool is like to everyone else. Ok, so by now you are thinking of someone else and referring to them in your mind as a fool. You are glad that your friendship only runs as deep as a Facebook friend. However, I want you to think about something. How often does your actions reflect those of a fool? Be honest. We all are guilty of acting foolishly sometimes. And to heap foolish on top of foolishness, we often fail to admit that our words or actions are those of a fool. I am guilty of this and so are you. but the wise listen to others.” (Proverbs 12:15). Today I want to walk my journey not living foolishly. I want to realize that the world does not revolve around me and my thoughts. Yesterday might have been April Fool’s Day but every day that I live like a mad she-bear in search for her cubs is actually a fool day. Today, let’s be intentional! Let’s examine the path before us and be wise. Let’s not think so highly of our thoughts and be open to the wisdom of others. Of course the assumption is that we are surrounded by other wise ones!!! To end, here is one of my favorite quotes. I hope it is not describing me or you. Have you ever tuned out when someone was giving a lecture or sermon but acted like you were listening? How about when someone is telling you something and because you really do not care, you check out? How often have you read a page or two in a book only to realize you do not even know what you just read? How about driving? Ever realized you were past a certain mile marker only to not remember passing the last exit? Wether it is sitting through a lecture, listening to someone tell a story, reading a book or even driving a car we all have been guilty of just going through the motions. While it might not be so bad to “check out” or go through the motions in some situations, it can be devastating when we do that with people’s pain. Here is what I mean. Someone asks us to pray for them concerning something really on their mind. You say you will but never do. When you see them again you even forget to bring it up. Ouch! That really hurts. Another person has a real need and you know you can help meet that need. You offer to help but then forget all about it. Whew! That is painful. Life gets so hectic that we often find ourselves just going through the motions. We stop living with intention. We no longer realize our purpose and place. Our goal becomes to just get to the next event or day. In the process we lose out on so many opportunities to be a blessing to someone and to be blessed ourselves. Let me say this: I do not want to live my life just going through the motions. I want to be intentional, strategic and live on purpose. My guess is that you do as well. It will require us to be more aware of what is going on around us. It means that we have to live not just for ourselves but for others as well. It means slowing down enough to care. It means redefinning what a successful day looks like. Everyone has a story and is on a journey. We need one another to make our life more complete and fulfilled. We need others who are not just going through the motions. If you are looking for meaning and purpose then be intentional in life. Stop going through the motions and see what you can do or where you can make a diference. Not only will you change someone else’s life but it will also change your life! I had the privilege of writing an article for the Lancaster County Chamber of Commerce digital magazine Connections. If you have not read the online magazine, it is a must-read for anyone involved in leadership on any level. The article, What’s Important Now: Making an Impact, tells the story of a family in our community and the various struggles they face in dealing with the many sides of poverty. The article challenges us all to think about success in life from a different lens. To read the story and find out what makes us truly successful go to the Lancaster Chamber Connections website and read the rest of my blog post. I find it ironic that Facebook has become an unsafe place to share anything. I mean isn’t it a social network, a place to connect people to people and ideas? It is the billboard where our lives meet the world. It gives each of us the opportunity to be on center stage and say “look what I am doing, hear what I am saying and understand what I believe about… everything”. In a good sense, Facebook has brought the world closer together and made it much smaller. However, this social networking has come with a huge price tag. You see, we long to express ourselves but we hate it and stand against others expressing themselves. We fear any one or any thought that doesn’t support our cultural bias or ideas. I refer to cultural bias in a general sense. Our culture is a sum of what we believe or adhere to and live our lives based on. For most of us we are free to believe whatever we want to regarding religion, politics, sports, people, heck we can even believe in UFOs if we want. However, once someone shares his or her cultural bias on just about anything they are attacked. I see it all over Facebook and I can’t help but think it polarizes people and creates intolerance of thought or expression. God forbid you like Tim Tebow or don’t like him. God forbid you like Glenn Beck or don’t like him. Republican? What is your problem? Democrat? What is wrong with you? Like snow? Get out of my life. Want warm weather? Move down south then you idiot. And let’s not even get started with religion. How have we come to the place where the greatest social media platform has become a hotbed for intolerance? Friends who think differently and are not part of the same culture as you are unfriended or blocked. Some are pushing for an unlike button. Once we have that there will be a push for a hate button. Actually we do not need an unlike or hate button. We have figured out how to communicate that to our “friends” just fine! I want to commit to not be afraid of different thought. I want to welcome anyone who disagrees with what I post to engage in great conversation. If I cannot accept that then I need to get off Facebook. However, I will not accept people who post fear-driven statements that are more of an attack of my culture or the culture of one of my friends. We must exist on this planet and be able to have different sports teams, political or religious beliefs, ideas, thoughts, tastes, etc. Let’s use Facebook to make “friends” despite our differences not polarize and alienate ourselves because of our differences. PS. Check out my Facebook friends. I have friends who are republican and democrat, Christian and atheist, snow birds and beach bums, lover of rap and lover of classical, love Steelers and love Patriots, vegetarian and carnivorous. I probably have a friend who believes in UFOs. And I am glad you are all my friends!! I just wanted to pause for a moment before the journey of 2011 ends. I believe that everyone’s journey matters to God and therefore it matters to me. This is not just a tag line that I picked up from somewhere. This is my philosophy of life and the culture that I am trying to create. As I reflect on this past year I am struck with the realization that it has been a very difficult year for me, my family and it has been a horrible year for some of my friends. Despite this my life is richer, fuller and more complete because our journeys have intersected. So many of you have taught me so much about God, life and what is most important in life. As I reflect on this past year, I realize that it is not about money, prestige, power, status or any other standard by which this world measures success. It is about relationships. It is about intersecting the journey of one another. At the point my journey intersects with someone elses, life happens. And this year life has happened over and over. For that, I am deeply grateful to so many of you! As you think about 2012, I hope that our journeys can intersect and life can happen again! I also hope that your journey intersects with Jesus Christ and you can experience true life that is found in knowing Him as your Savior! Let the 2012 journey begin! As I sit here at Starbucks I am struck with this thought: what do people want in life? It seems like such a simple question. But as I ponder it further it is not an easy one to answer. In fact, as I look around the coffee shop here I am watching everyone intently. (I hope they do not think I am staulking them.) In the corner are three young ladies who apparently havent see each other in while. They keep taking pictures of themselves. They even asked a stranger to take a picture of them. Nice camera too! Then there are the two ladies who are sititng here and talking about all the pain in their lives this past year. (Sorry for listening in!) There is the man sitting all alone texting constantly. I wonder if he is fighting with his wife! He has a ring so I assume he is married. Or perhaps he is just texting “sweet nothings” to her. Then there is the couple next to me who have obviously been married for a while. He is on his computer and she is reading the paper. I am not sure they have even said a word to each other. Oh the sweet bliss of being with your significant other and not needing to exchange words!! And last of all is the dramatic woman who is standing and animating something to her friend. Haha, there is one in very crowd. Awe! A father and grown up daughter just entered and sat next to me. That warms my heart. I should join them. No, I will let them be! So sitting her comtemplating what people want I think I have my answer! People want significance. They want to be connected in relationships that matter. People want to be valued and appreciated. We all desire to know that our existence has meaning in a substantial way. Therefore we will continue the quest in 2012. We will begin relationships where we can find meaning and significance and we will end relationships that no longer offer the same. It is kind of a rat race that no one enjoys but it is wired into us all. How about you? What do you want in 2012? How can I help you process this past year? Want to meet for coffee? If you live in Lancaster County and are not a hermit, you know by now that the new Chick-fil-A is now open for business. Most of you also know that there have been lines both inside and outside almost every day since it opened. In fact, the photo above is what is looked like the day before it opened. In cold rain, many camped out in order to be one of the 100 lucky ones to get a free meal every week for a year. Living in the development where the Chick-fil-A is located afforded me the opportunity to watch these lines every day. It was intriguing for sure. Here is what I learned from the opening of the new Chick-fil-A. People will do crazy things to save money. 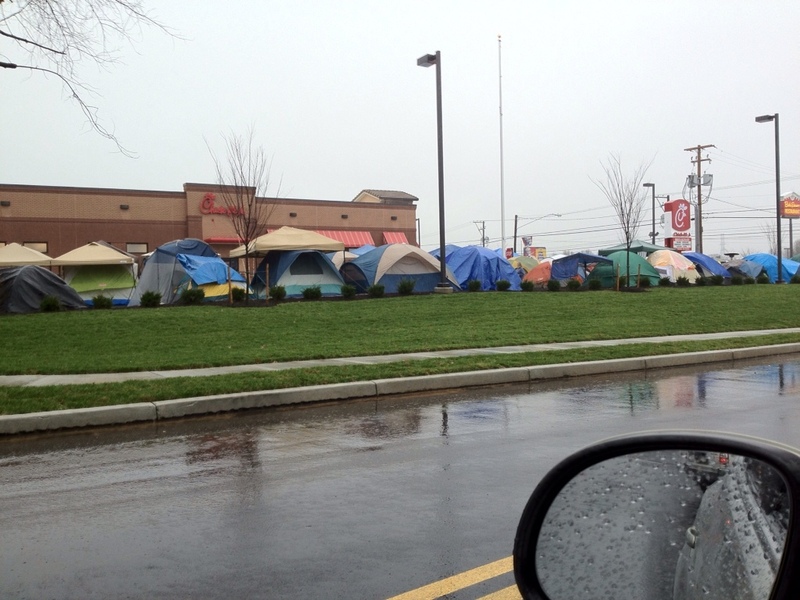 Camping out for 24 hours in cold rain to get a free meal each week would constitute to many as crazy. Some even sat outside their tents in the cold rain just so they could visit with each other. People really like Chick-fil-A. It is almost as if everyone was ready for a different kind of fast food restaurant. For those who have braved the lines there has been a satisfaction of food and service that one usually doesn’t get from a fast food restaurant. There seems to be a hub of conversation that is not consistent with most fast food restaurants. People are enjoying themselves and each other. Service Matters. Last week I went through the drive-thru just to get an 8 piece of chicken nuggets. The line was not that long so it should have taken less than 5 minutes. When I got up to the window to pay I was told that I would have to drive up as they are waiting on the chicken. 15 minutes later I was ready to blog about the honeymoon being over. I expected some cashier to come up and give me my food and not even apologize for the wait. (Sidebar – we Americans are spoiled.) I was pleasantly surprised when the manager himself came out with my chicken nuggets. He apologized and gave me a coupon for a free chicken sandwich. He then took the time to talk to my kids who were with me. I was impressed. There are two ways to make chicken. If you have been to Chick-fil-A then you know of the quality of their chicken. It is, well, real. Right across the street is another chicken fast food restaurant. The chicken there is often, well, full of filler. Kudos to Chick-fil-A for not compromising on quality. By the way, it will cost you a little more to get the quality. These were four things I learned with the opening of Chick-fil-A in my community. What about you? What have your experiences been with Chick-fil-A?